This spring is the 40th anniversary of the Harvard strike, one of the iconic moments of 1960s student protest, but — strangely — the only notice thus far has been in the “Opinion/Taste” pages of the Wall Street Journal. The strikers – I was one of them (as a grad student) — demanded an end to university complicity in the war (kicking ROTC off campus); an end to evictions of working-class people from property the university wanted to develop; and the creation of a black studies program. 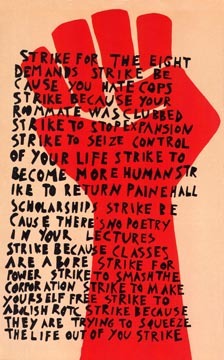 “Strike to become more human,” said the famous poster with the red fist.